This guide describes how to import cost data using the Management API. Importing cost and click data for non-Google paid campaigns allows you to leverage the Google Analytics platform to perform ROI analysis and compare campaign performance for all your online advertising and marketing investments. Note: This guide is not intended for Google Ads campaigns. To import Google Ads data link your Google Ads account to Google Analytics. Read the Data Import Guide (Help Center) to learn about the data import feature. Read the Data Import Developer Guide to learn about concepts on how to use the Management API to import data. Read the Upload resource reference to learn about uploading data. Prepare the cost data CSV file for upload. Upload cost data using the Management API. To perform ROI analysis on paid campaigns, cost data from external sources can be joined with session data in Google Analytics by adding campaign tracking parameters to all destination URLs in the non-Google ad system you're using. In the following example advertisement, the destination URL is tagged with campaign tracking parameters (utm_campaign, utm_source, utm_medium, utm_term). This ensures that visits to the website from ad clicks are associated with the summer sale campaign in Google Analytics. This ensures that Google Analytics has the campaign tracking parameters associated with the session and that there is a way to join Google Analytics data with the external cost data source. To import your cost data you must create a Data Set. A data set is used to represent one or more external data sources in Google Analytics. A data set can only be created through the Web Interface. Select the Data Import tab. Click the New Data Set button. Select the Cost Data for the type and click Next Step. Name the data set and select one or more views (profiles) to enable Cost Analysis in reports and click Next Step. Select the Dimensions and Metrics you intend to upload. Select the desired Import Behavior. This setting controls whether to overwrite or sum cost data in cases where a duplicate key is found. To learn more about import behavior see the Cost Data Summation vs Overwrite section of the Data Import Developer Guide. Figure 2: Creating a cost data set. 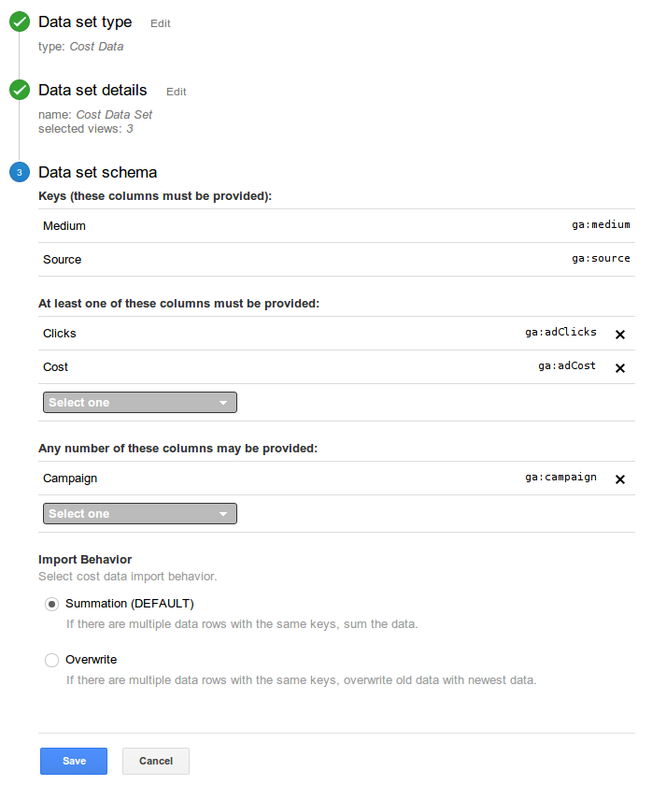 Google Analytics expects cost data to be uploaded in a specific format with certain values. You need to make sure that the cost data exported from an external source meets these requirements before uploading. Rename the column headers to match those recognized by Google Analytics. You can retrieve the header from the data set details page in the web interface. Add any required values that are missing. Where applicable, values in the CSV file should match the values used for campaign tracking parameters. Figure 3: Exported cost data CSV file. Figure 4: Formatted cost data CSV file. Note that for the first row of cost data, the values for ga:source, ga:medium, ga:campaign, and ga:keyword are consistent with the campaign tracking parameter values set as part of the ad URL. See the Data Import Developer Guide for general file format constraints. Once you've created the Data Set and prepared your cost data for upload in a CSV, you're ready to upload your cost data using the Management API or through the web interface. Uploaded cost data will be available as part of the Cost Analysis reports under Acquisition in Google Analytics as well the Core Reporting API.